Truth be told, the only thing that makes this crumble breakfast is the fact that I had it for breakfast. When it comes to breakfast, I see no reason why we need to limit ourselves to what is traditionally considered to be breakfast food. What is one country’s dessert, or another country’s lunch (Filipino breakfasts have rice and meat and egg and condiments! ), may be your country’s breakfast. So why even bother with the boundaries of cold cereal when breakfast can one glorious place that needs no plane or visa to get to? Not that I have anything against cold cereal. I actually do love it (I’m serious), especially with nuts and fruits, drowning in straight-from-the-fridge milk. But if we just open our breakfast plates to other than just the usual suspects, perhaps more of us would be eating this very important meal. This is something I threw together because I had two nectarines sitting around, on the verge of neglect, though still hopeful and tarty. 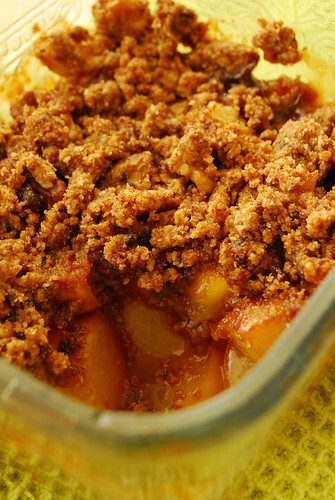 I have written the recipe below with four nectarines because I ended up using only half the crumble topping for my two. You can make the full recipe below for breakfast (or dessert) for four, or do what I did: Use two nectarines and half the crumble topping…keeping the other half in the fridge for breakfast or dessert the next day, using either nectarines again or any other fruit (or mixture of fruits) you deem crumble-worthy. We had apple crumble for the next day’s dessert (I used only one apple) with the other half of the topping, wherein I substituted the vanilla below for a nice dusting of cinnamon. – Seed and chop nectarines into chunks. Place them in a bowl with a sprinkling of lemon juice (I used less than half a lemon), a few drops of vanilla extract, the white sugar, and the teaspoon of all purpose flour, and toss to combine. Set aside and get on with the crumble topping. – Combine butter, muscovado sugar, whole wheat pastry flour, and nuts in another bowl and rub dry ingredients into the flour with your fingers until the whole thing resembles coarse crumbs. You can use a pastry cutter but really, why bother with something more to wash in the morning? – Place prepared nectarines in an oven-proof dish that will accommodate all of it leaving some room on top for the crumble. Alternately, you can also divide the fruit into individual dishes. – Crumble topping over the fruit. – Place your crumble dish (or dishes) on a baking sheet (to catch messy drips and make things easier if you are dealing with multiple dishes) and bake in a 180C/350F oven for 45 minutes to 1 hour, until filling is bubbling. – Serve with yogurt or cream. I made this one morning when I woke up earlier than usual and the sun was shining and everything looked fresh and promising (it rained later that day, but what better weather in which to eat warm crumble leftovers right?). It doesn’t take much time to whip this up, though you can also prepare the crumble mixture the night before and just top your fruit with it the next morning. Preparing the fruit is not something I recommend doing ahead of time though as they will brown and look generally down-trodden if you leave them for long.